Using dried beans is the most authentic way to prepare this dish, but to save time, we’ve substituted canned beans. Sautè onion and green pepper in oil until onion is transparent, about 6-8 minutes, stirring often. Add garlic and stir for one minute. Add broth and simmer on low heat for 10 minutes. Add beans and remaining ingredients except wine, and simmer for 20 minutes. Add wine and remove bay leaf. Serve over hot cooked rice. 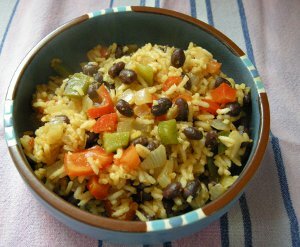 This Costa Rican staple of rice and beans is usually eaten for breakfast, although it’s not unusual for people in this Central American country to eat this dish several times a day. Serve with some fresh, sliced papaya or mango or other tropical fruit. 1. Heat oil in a large skillet over medium heat. Add onion and sauté until it becomes translucent. Add garlic and sauté until golden. 2. Add remaining ingredients and cook until heated through, stirring well. Serve warm. Gallo Pinto is one of those dishes that seems to taste better the next day. 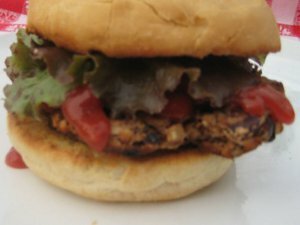 Sue submitted this abbreviated version of a wonderfully flavorful recipe from her cousin Ellen. If you’re really in a hurry, substitute 1 tsp. onion powder for the diced onion. You can also vary the amount of jalapenos to your taste. Combine all ingredients in a soup pot; heat to boiling; reduce heat and simmer for 5 minutes. Garnish with fresh chopped cilantro.